Are you happy juggling the data that social media, for instance, generates? Are you genuinely excited by procedures for gathering, preparing, and analyzing data? Do you want apply these procedures using complex data in ecological systems? The Mathematics in Data Science Master's program at the Technical University of Munich (TUM) rigorously prepares you for working in the future-proof area of big data. As a data expert, you are sought after in research and development, the finance sector, biotechnology and logistics, the health system, insurance companies, and IT security. The main focus during the Mathematics in Data Science Master’s program is on the areas of Data Engineering, Data Analytics, Data Analysis, Machine Learning, and Data Science. Students therefore focus on techniques of data retention and data evaluation. They learn to tailor these procedures to specific problems and to combine or redevelop them, thereby deriving prediction and classification models. In addition, they deal with the development of algorithms for problem-solving purposes. Interdisciplinary courses are equally important elements of the Master’s program. These deal with the social and political implications of big data as well as conveying fundamental legal knowledge and foreign language expertise. If you want to start your Master's program in the winter term 2019/20, you should apply as early as possible, starting from January 1st: print the registration form and all required documents via the TUM Online-System and send the required documents by mail to the matriculation office at the TUM until May 31st. Please be aware that missing application documents can no longer be submitted after the official application deadline (Nov. 30th / May 31st). Exceptions are not possible! Therefore make sure to plan accordingly, esp. language certificates etc. "Mathematics in Data Science" commences in the winter semester of 2015/16 as a full-time study program. The standard duration of study is four semesters. Students can commence the Master's program at TUM either in the winter or summer semester. "Mathematics in Data Science" can be pursued entirely in English. Some teaching sessions take place in German. Methods and algorithms from Statistics, Machine Learning, Optimization, and the Theory of Data Representation are important mathematical elements of the Mathematics in Data Science Master's program. The TUM Department of Informatics offers a Master’s program in Data Engineering and Analytics. This focuses on technical and algorithmic aspects. The courses of study overlap with one another in part, such that students of each course work closely with one another. Details of all the modules that are relevant to the degree program, along with associated times and locations, are available in the department’s curriculum at TUMonline. Here you can create your own timetable and save it digitally. A six-week professional internship is integrated into the program. The accompanying Internship Seminar offers you the opportunity to inform yourself about suitable occupations and to discuss the experience you acquired during the internship. In order to commence the Mathematics in Data Science Master’s program at TUM, a recognized university degree in Mathematics, Informatics (with a minor in Mathematics) or a comparable study program is required. 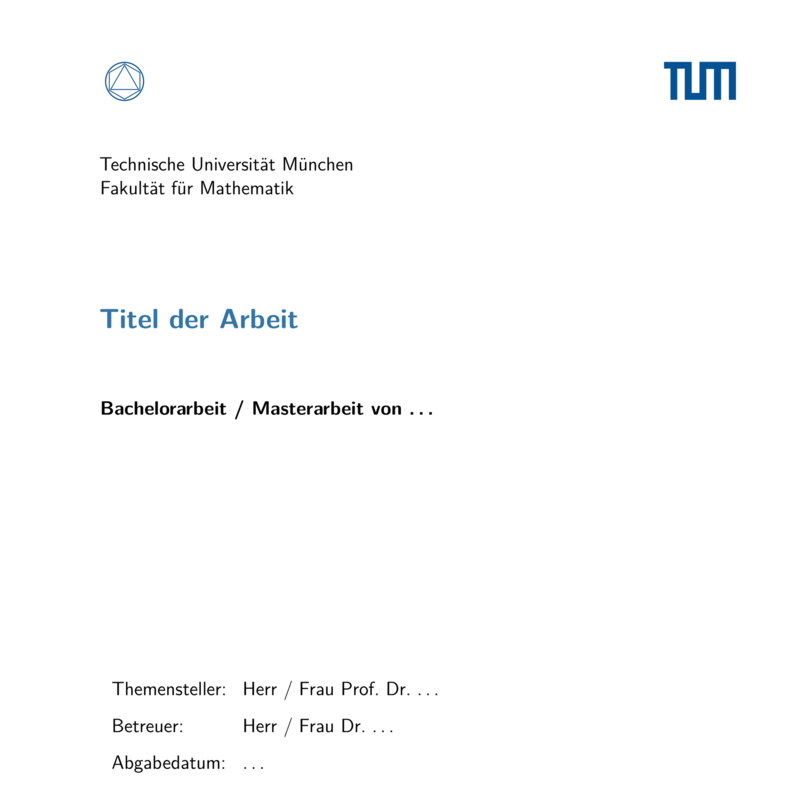 Those who are interested should refer to the program-specific Examination Regulations under "Grundlagen aus dem Bachelorstudiengang Mathematik der TUM” [“Foundations for the TUM Bachelor's program in Mathematics] and to the Attachment 3, to find out which competencies must be proven in detail. Applicants who acquired their university degree in Bangladesh, China, India, Iran, or Pakistan must provide proof of a sufficient pass mark in the admission test GRE (Graduate Record Examination) - Quantitative reasoning: 154, Analytical writing: 3,0. Institutional Code: 7806 Department 5199. Alternatively, students can apply using the associated score card for the Indian GATE-Test (Mathematics). or Cambridge Main Suite of English Examinations. If you wrote your Bachelor's thesis in English, adequate proficiency in English is deemed proven. Some institutes send your results directly to TUM if you provide the correct address (see infobox). If you send in your language certificate yourself, we need a certified copy. Specific knowledge of the German language is not decisive when it comes to admission to the Mathematics in Data Science Master’s program. Nonetheless, the federal government stipulates that international students must have acquired at least a basic level of German language knowledge after two semesters at TUM. If you do not speak German, it is imperative that you complete a language course. Students from abroad who can already speak German are to include proof of their language skills in their application. Here you will find further information on verifying your language skills and a list of certificates recognized as proof of German or English language proficiency. Language exams are not always on offer and the grading of tests takes a while. If the test result has to be authenticated by a notary, one has to take into consideration the time this will take. Regardless, certificates must have been received at TUM by the end of the application period. So plan accordingly! The VPD certificate can be applied for the whole year round at TUM using the University Application Service for International Students, however this process must have been completed before the end of the application period. Please forward the VPD certificate directly to TUM as soon as you have it. The date of receipt at TUM is decisive! You do not have to have completed your bachelor’s program upon applying: some documents can be submitted after the end of the application period, including for example the Bachelor’s Certificate. The deadline for doing so is approximately 5 weeks after the beginning of the first semester. Bachelor’s certificate and bachelor’s diploma or comparable qualification for admission ✓ If you proceed directly after your TUM Bachelor to the TUM Master your diploma will be forwarded to the Student Registration Office automatically. Our application wizard will guide you step by step through the online application procedure. Important: Under the category "Studiengangsauswahl” [choice of degree program], select "konsekutives Masterstudium” [consecutive master's program] as the form of program. Upon completing the Online Application, you will receive a list of documents that have yet to be submitted as well as the application for admission to the aptitude assessment. Further Documents required for applying at TUM, for example health insurance etc.